Fun fact: I haven’t been on a plane since well before my kids were born. Growing up we used to take the most amazing family vacations – Europe, the Middle East, tropical islands. I did enough traveling with my parents too last me a lifetime and I’m so grateful we had that opportunity. But trying to imagine my two young children on a plane is enough to make me thankful they don’t mind long car rides. One day my kids (now 3 and 5) will be old enough to understand that we can’t open windows on the plane but until then they can travel with their iPads. 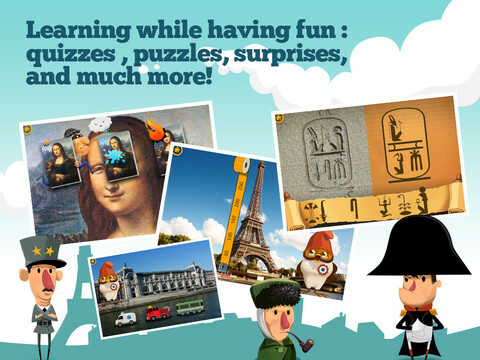 Discover Paris is a wonderful destination app that transports kids to the French “City of Lights” while teaching them important cultural distinctions in a way that’s easy for young players to understand. 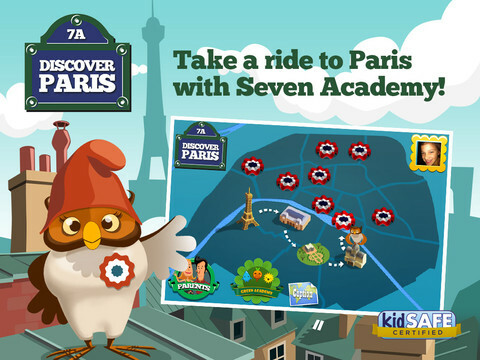 A wise owl travels throughout Paris showing players landmarks through real photographs. Historical and factual information is presented in fun ways. Each location also integrates learning games in which the players interact with the app. Parents can use the Parental Dashboard feature to follow players’ progress in real time. Paris is high on my Places to Go When the Kids Move Out list so I was more than happy to review this app (it’s a little advanced for my two). I consider myself a Francophile but even I learned new things about French culture and history. I was a little disappointed that only the first portion of the app was accessible with the free download and I would have to make an in-app purchase to continue playing. If a Paris trip isn’t in the family budget for this summer then Discover Paris is a close second. School-aged children who are interested in learning about new places will stay engaged while being able to navigate through the app. It will be hard to say “Au revoir” to this app!